This continuing medical education offering is intended for physicians, pharmacists and nurses. Examine Nazi Racial Hygiene Theory as an all-encompassing way of life that guided the development of theory, practice, and public policy. Explore the transgressions in medical practice and the development of public policy that occurred as a result of Nazi bioethics. 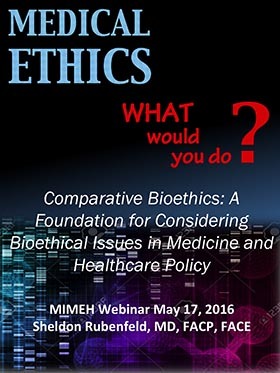 Trace the trajectory of the development of bioethical codes of conduct including traditional Jewish medical ethics, the Hippocratic Oath, Nazi bioethics and contemporary secular bioethics. Utilize comparative bioethics to emphasize the importance of the development of a strong moral ethos that values the dignity of the individual above all else. In support of improving patient care, this activity has been planned and implemented by the Maimonides Institute for Medicine, Ethics and the Holocaust and the Center for Education Development (CED). CED is jointly accredited by the Accreditation Council for Continuing Medical Education (ACCME), the Accreditation Council for Pharmacy Education (ACPE), and the American Nurses Credentialing Center (ANCC) to provide continuing education for the healthcare team. Center for Education Development designates this live educational activity for a maximum of 1.0 AMA PRA Category 1 Credit™, 1.0 CPE credit (UAN # 0498-9999-16-004-H05-P) or 1.0 ANCC credit. Participants should claim credit commensurate with the extent of their participation in the activity. Participants must participate in the session and complete an activity evaluation before April 20, 2017. Pharmacists are required to pass the post-test with a minimum score of 70%. SHELDON RUBENFELD, M.D., F.A.C.P., F.A.C.E. Sheldon Rubenfeld, M.D., F.A.C.P., F.A.C.E., is Clinical Professor of Medicine at Baylor College of Medicine, Clinical Professor of Nursing at the University of Texas School of Nursing in Houston, and a Fellow in the American College of Endocrinology. He was in the private practice of endocrinology and internal medicine for 36 years until his retirement in June 2014. Dr. Rubenfeld published scientific papers on endocrine disorders and two editions of Could It Be My Thyroid? He has taught "Jewish Medical Ethics" and "Healing by Killing: Medicine in the Third Reich" at Baylor College of Medicine and the University of Texas Medical School at Houston for seven years, and publishes and lectures throughout the world on both subjects. In 2007, he created Medical Ethics and the Holocaust, which included a six-month exhibit How Healing Becomes Killing: Eugenics, Euthanasia, Extermination at Holocaust Museum Houston, and the Michael DeBakey Medical Ethics Lecture Series. The 29 speakers included Nobel Laureates and other distinguished scientists, physicians, lawyers, bioethicists, historians, and clergy. Dr. Rubenfeld published Medicine After the Holocaust: From the Master Race to the Human Genome and Beyond in 2010, which included selected manuscripts from the lecture series. Dr. Rubenfeld is the founding chairman of the Center for Medicine After the Holocaust, whose mission is to challenge doctors, nurses, and bioscientists to personally confront the medical ethics of the Holocaust and apply that knowledge to contemporary practice and research. Among other activities, the Center hosts a biennial trip to European medical sites relevant to the Holocaust, and is preparing a documentary about medicine and the Holocaust. In 2012 and 2013, the Center for Medicine After the Holocaust organized lecture series on human subjects research after the Holocaust in Houston, Texas and Berlin, Germany. Dr. Rubenfeld published Human Subjects Research after the Holocaust in 2014, which included manuscripts from both lecture series. In April of 2015 he convened the First International Scholars Workshop on Medicine After the Holocaust to promote medicine and the Holocaust as an academic discipline in medical centers throughout the world. Faculty reported the following financial relationships. A copy of Center for Education Development's policy on resolving conflicts of interest can be found at www.cedevelopment.org/about.html. Sheldon Rubenfeld has nothing to disclose. Thomas Zimmerman, PhD (Reviewer, CED) has nothing to disclose. John Zitel (Reviewer, CED) has nothing to disclose. Danielle Amodio (Planner, CED has nothing to disclose. Created and published by Center for Education Development. Copyright © 2016 Center for Education Development. All rights reserved. No part of this publication may be reproduced without written permission from the publisher. The material presented at or in any of CEDevelopment.org continuing medical education activities does not necessarily reflect the views and opinions of CED. Neither CED nor the faculty endorse or recommend any techniques, commercial products, or manufacturers. The faculty/authors may discuss the use of materials and/or products that have not yet been approved by the US Food and Drug Administration. All readers and continuing education participants should verify all information before treating patients or utilizing any product.